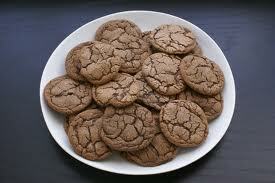 I've attempted Nutella cookies before ... they didn't turn out as I had hoped. These ones? Got the recipe from Pinterest and just having this post up proves they rocked. Crunchy on the outside and smooth in the middle ... bake for 11 minutes and flatten with a fork - works well *wink*. 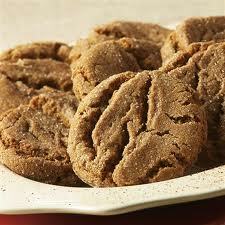 - Mix together flour, cocoa, cinnamon, baking powder, baking soda and salt. Set aside dry ingredients. - Cream together butter, granulated sugar and brown sugar until light and fluffy. Mix in Nutella and vanilla extract. - Add flour mixture and mix until just incorporated. Add chocolate chips. - Chill for 1 hour. (This step can be skipped if you want, but I always chill my cookie dough because it apparently makes a huge difference). - Drop tablespoons of dough 2 inches apart onto parchment lined baking sheets. - Bake at 350 for about 11 minutes until the edges look set. - Cool on baking sheet for 5 minutes then carefully remove to cooling racks. 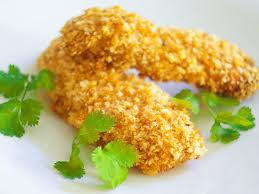 I hate chicken fingers. HATE them ... not because of how they taste, oh no. But because of how they're MADE. Yuck. But the idea is so great ... so, I decided to adapt a few different recipes and come up with my own "homemade" version. The kids love 'em. - pour Panko and parmesan cheese into a pie plate. - pour about 1/4 cup of plum sauce into a bowl. - take one chicken strip and "paint" sticking ingredient onto it with a BBQ basting brush. - roll in Panko/parmesan mix until coated. - place on a lightly sprayed cookie sheet. - repeat until all are done. - bake for 20-30 minutes ... or until cooked through and at desired crispiness. Sometimes, dinner is just whatever is in the cupboard. But last night we had a family over for dinner and I wanted something nice. Problem was, I hadn't REALLY prepared for it. So, instead I made this one up and it.was.YUMMY. 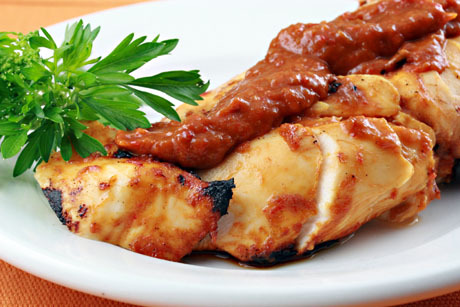 - place chicken breasts in dish. - mix BBQ sauce, mango juice and honey in a bowl. 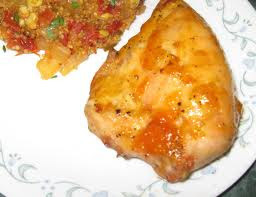 - pour over chicken breasts. - bake at 350F, covered, for 45minutes; then uncovered at 375F for 15minutes. 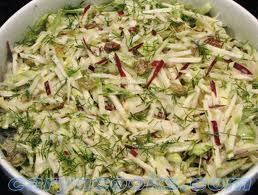 - in a large bowl, dissolve yeast in warm water. - add sugar, shortening, creamer, salt and 5 cups of flour. 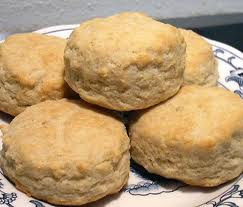 - stir in enough remaining flour to form a soft dough (dough will be sticky). 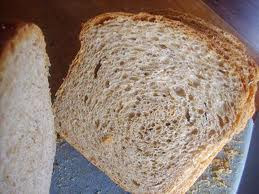 - turn onto a floured surface; knead until smooth and elastic, about 6-8minutes. - place in a bowl coated with cooking spray, turning once to coat the top. - cover and let rise in a warm place until doubled (about 1hr). - turn onto a lightly floured surface; divide into 24 pieces. 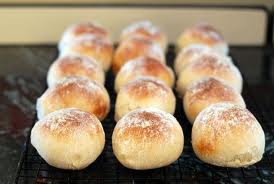 - shape each into a roll, place 2 inches apart on baking sheets covered in cooking spray. - cover and let rise until doubled, about 30 minutes. - bake at 350F for 12-15 minutes or until lightly browned. - remove from pans to wire racks. Oh. I love these. They're great for a potluck ... great for whatever. My mom had this recipe when I was a teenager, and I remember stuffing my face with them whenever she made them. So ... beware. You can't have just one. - place drumettes in the oven at 400F for 7minutes. - turn over, cook for another 8minutes (for 15minutes total). - boil in microwave for 2 minutes. - brush 1/2 of the sauce onto drumettes. - bake at 400F for 15minutes. 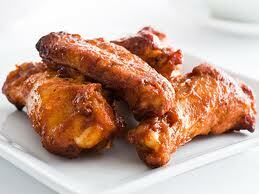 - turn over, baste with remaining sauce and cook for an additional 20minutes. A few years ago, I decided that I wanted to be the mom who made the very BEST chocolate chip cookies ... ever. I tried recipe after recipe - not quite getting it right. And then, I remembered an episode of "Friends" where Phoebe gives a cookie to Monica for a wedding gift ... so she could re-make the most perfect cookie. By the end ... you realize it's a Nestle Toll House cookie ... and that's when I realized, I would try the same. - combine in a bowl. - cream together in a different bowl. - add one at a time, mix well. 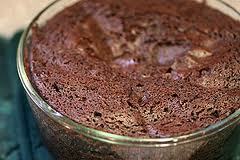 - add flour mixture to creamed mixture until incorporated. - bake at 375F for 9minutes ... they will look a little underdone, but after they've cooled - they set. I'm out of bread ... so, out came the bread-maker and now it's whirring up a storm and the house is going to smell far too good to sleep. - measuer ingredients into baking pan in the order recommended by the manufacturer. - insert pan into the oven chamber. - select "2lb" and "whole wheat cycle". I'm literally eating this while I type. MMM. I've made variations of this before - and I thought I'd write it down. With the kids bed, hubby away and craving a vegetable - I whipped this up and now the house is silent and my tummy is happy. Leftovers for lunch tomorrow ... mmmmm. - steam cauliflower until soft. 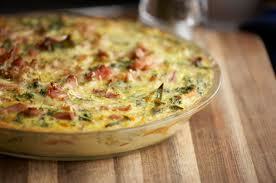 - saute bacon and onion together in a large pot; cook until done - not crispy. - add steamed cauliflower to bacon mixture. - add sherry; simmer for 10 minutes. - transfer 1/2 the mixture to the blender, blend and place in a large bowl. - transfer the rest of the mixture to the blender, blend. - place all the blended soup back into the pot. - add salt/pepper to taste. 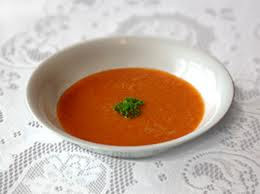 ** this is a DAIRY-FREE soup, "creamy" texture w/out milk. But you could add cream if you wish. My friend Char, is a great cook. I've had this at her home during the fall and winter - it's so so so good. And now, it's a Christmas tradition in our home too *grin*. 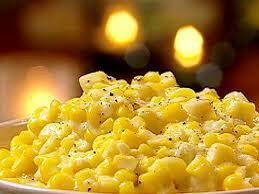 - place corn and remaining ingredients in separate pot. - bring to gentle boil, add roux, stir well until thickened. - keeps refrigerated for ... a long time *grin*. This is one of my hubby's faves ... it takes a while, but it's worth it. - cut peppers in thirds, remove seeds and place cut side down on a cookie sheet. - broil until skins are blackened and puffed. - place in a paper bag to steam. - meanwhile, melt butter and saute onions and garlic until soft. - removed cooled peppers from bag and peel off skins. - cut into chunks and add to onions/garlic. - cook for 2-3 min. - add broth, cover and simmer. 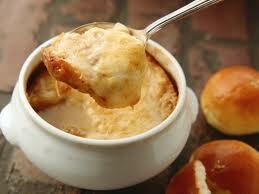 I remember the first time I had French Onion soup ... and I realized that it was amazing. But there are a couple of secrets to it ... one, you need to slow cook the onions (covered) for about 45minutes as they caramelize. At least that's how I like it. Two, you need to use good Sherry. Need I say more. - in a large saucepan, cook onions in butter on low heat until caramelized. - add bee broth, sherry, worcestershire sauce; bring to a boil. - pour into individual ovenproof bowls. - place a slice of toasted baguette in each. - place under broiler and heat until cheese bubbles. I found this on Pinterest ... I have made the vanilla, but not the chocolate or other variations ... YET. It. Was. Yummy. For Karrot's Cake. - Place butter in a large mixing bowl and blend slightly. Add cream cheese and blend until combined, about 30 seconds. 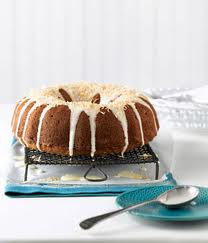 - Add vanilla extract and powdered sugar and blend on low speed until combined. Increase to medium speed and beat until it begins to get fluffy. - Beat until fluffy, about 1 minute. For a Stronger Cream Cheese Flavor: Use an additional 4 oz. (½ block) of cream cheese. This is good for any cake/cupcake recipe that is traditionally topped with Cream Cheese Frosting, like Carrot Cake, or Red Velvet Cake. For Chocolate Frosting: (my favorite!) add ½ cup unsweetened cocoa (I use Ghirardelli brand, it's really good). Add the cocoa powder before adding the powdered sugar, so it gets fully incorporated into the butter and cream cheese. Strawberry, Blackberry, etc: Add 2-4 tablespoons of preserves. Depending on how chunky or seedy the preserves are, you may want to blend it in the food processor, and/or strain it through a fine strainer before adding it to the frosting. Add the preserves to the frosting mixture before adding the heavy cream. Depending on the amount of preserves you add you may need very little or no cream, especially if you want the frosting thick enough to pipe. A final option would be to add a drop of food coloring to add to the color of the preserves (for example, pink coloring for the Strawberry flavor). 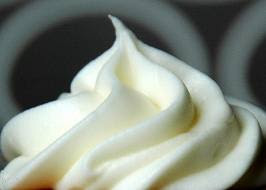 * This recipe will frost about 22-24 cupcakes if you are piping a nice swirl, or even more if you just spread it on. If you're making a cake, this will frost and fill a two layer 9" cake. From the Best of Bridge series, and THE VERY best carrot cake you will ever consume. No raisins, no pineapple, no walnuts. This one was on my mom's roster for "company chicken". It was my FAVOURITE ... not sure if she knows that. Haven't had it in years, but I stole it from her recipe box when I got married. I couldn't find a good enough pic, so no-photo it is. - brown chicken in small amount of oil, in a frying pan. - mix honey, lemon juice, soya sauce and ketchup together. - pour over chicken, marinate overnight. I had gone to someone's house a long time ago, and was served an apple cake that was yummy and memorable. I never got that recipe, but tried a few on my own and found that this one was the best. It tastes like fall. - combine all dry ingredients in mixer using a flat beater. - add applesauce, butter and eggs. - turn to speed 2, mix 1 minute, scrape bowl. - turn to speed 4, mix 30 seconds. - add apple, stir until blended. 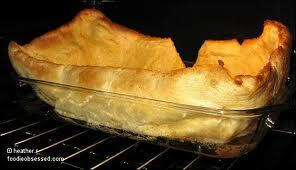 - pour batter into a GREASED and FLOURED 9x13 baking dish or a bunt pan. - bake at 350F for 35-40 minutes. 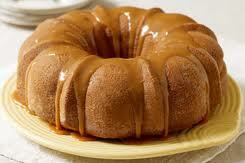 ** serve with warm caramel sauce. This recipe comes from Charmaine ... the queen of incredible cooking. This is a go-to recipe for me in the fall/winter when company is hanging out on the couch watching hockey. It's hot and yummy - but the name is deceiving. It's more like a super-moist-steamy-hot-from-the-oven-cake. If you undercook it, it has a molten middle ... but due to eggs being in this recipe, I stay away from undercooking it. - place those three ingredients in a bowl. - pour 1/2 cup boiling water over, blend until smooth. - add the egg, blend. - pour into a GREASED 2qrt dish. Cover with a lid. 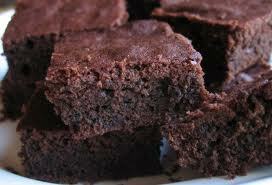 - bake at 350F for 30-40minutes, or until a cake-tester comes clean when placed in the middle. - serve with ice cream and chocolate sauce. I first had these at the annual Friend's Reunion ... Deb brought them, and they were so fantastic, they've become a staple in our home. They are so chewy, and topped with ice-cream, they are a quick and easy hit with drop-in company. 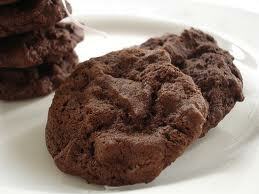 These are Josiah's favourite ... he calls them "black cookies." - In a saucepan over very low heat, melt 1 cup chocolate chips. - In a bowl, mix together flour and baking soda. - In another bowl, beat butter, cream cheese and sugar until smooth and creamy. - Beat in egg until well incorporated. - Beat in melted chocolate until well combined. - Add flour mixture and mix well. 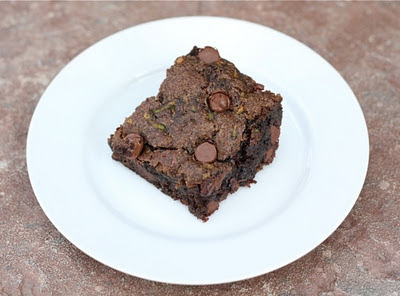 - Fold in remaining chocolate chips and nuts. - Drop by tablespoonfuls, about 2 inches apart, onto ungreased cookie sheet. 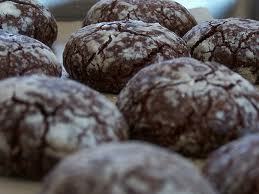 - Bake in oven for 10-12 minutes or until cookies are firm around the edges. Immediately transfer to wire rack to cool. 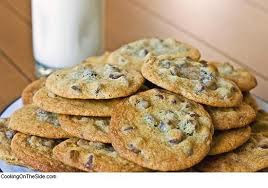 - If desired, melt additional chocolate chips to drizzle onto of cookies as soon as they come out of the oven. - stir in dry ingredients. Cut in butter. - stir in milk until dough clings together. - roll with rolling pin. - bake at 400F for 20 minutes. SO yummy ... but so much butter, it's only for special occasions. - soak rice overnight in water, drain. - melt butter in a 2qrt (2lt) casserole dish. 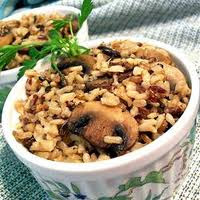 - add rice and mushrooms (water chestnuts, if desired). - pour in chicken stock. - bake at 350F for 2 to 2.5 hours, covered. I grew up on this ... makes me think of fall and hearing my mom teach piano in her studio. - bake covered at 350F for 1hr, and an additional 20minutes uncovered. Bonnie gave me this recipe when I was needing something for Katia's First Birthday Party-BBQ. It's crazy good. 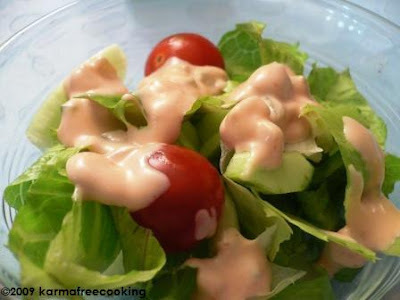 Combine salad; combine dressing; combine together. When I was a little girl, the Jacksons came up to our home from Seattle one weekend. Michelle made these for breakfast. They have been a tradition in our home ever since. - place margarine in 9x13 glass pan, melt in oven. - mean while, add all remaining ingredients to a bowl, mix. This should be lumpy ... if you mix to long, when it bakes it becomes eggy and thick instead of thin and puffy. Serve immediately, or it'll sink. Sprinkle with icing sugar and serve with syrup. I found these on Pinterest ... and served them with cream cheese frosting to Jason and Lu. They said there was NO way you tell there were veggies in them ... and they were right. I ate 4 that night. I found this recipe on Pinterest and made them for Christmas 2011. They were a hit, and are now on the roster for next year. Place the butter and icing sugar in the bowl of an electric mixer and beat for 8 minutes or until pale and creamy. Add the lemon juice, zest and vanilla and beat until combined. Add the flour and corn starch and beat just until a smooth dough forms. Turn dough onto a lightly floured surface and divide in half. Place each half onto a large piece of baking paper form into a 20cm (8in) long log. Wrap well in the paper and refrigerate for 1 ½ hours or until firm. Preheat the oven to 180°C/350°F. Line two large baking sheets with baking paper. Unwrap one of the dough logs (keep the other in the fridge) and slice it into 1cm-thick rounds. Place onto the prepared baking sheets 5cm (2in) apart and bake for 15-18 minutes or until light golden. Remove from the oven and cool in the sheets for 5 minutes. 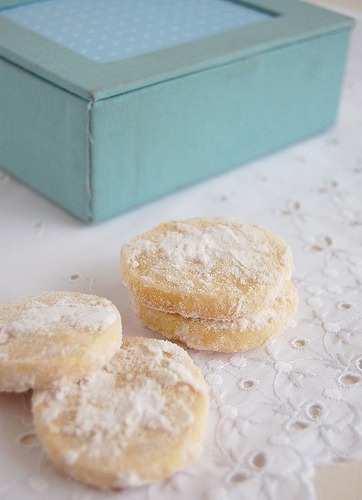 Gently toss the warm shortbreads in the extra icing sugar and allow to cool completely on wire racks. For BBQ: place on greased BBQ, grilled over med/high heat. Close lid and cook for 25-30 minutes (or until 150F), turning and basting. Remove from grill and let rest (core temp needs to reach 160F). Slice into 1/2 inch slices. 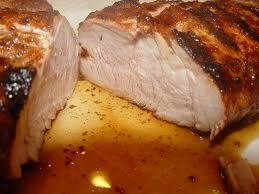 For oven: place pork in a baking dish with all of the marinade. Bake at 375F uncovered for 10 minutes, and then covered for an additional 40-50 minutes. This won't try out because it's covered - so check pork temp before removing (150F). Let rest (to 160F). Cut into 1/2 inch slices. I make these for Mimmo because there are no eggs in it. They're crispy/chewy and coconuty. Mmmm. 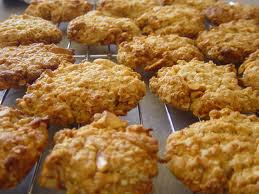 - Combine flour, rolled oats, coconut and sugar. Make a well. - Melt butter and syrup in a small saucepan. - in a separate bowl add boiling water to baking soda, then pour into butter/syrup mixture. It will foam. - pour into dry ingredients. - place tsp sized balls onto a cold, greased cookie tray. - bake at 350F for 15-20 minutes, until dark golden brown. - while still warm, remove to a cooling rack. Directions: mix all ingredients together. pour over chicken. marinade for 2 hours. In a medium pot, simmer butter, corn syrup, brown sugar and cocoa. Bring to a boil over medium heat. Remove from heat and add vanilla. 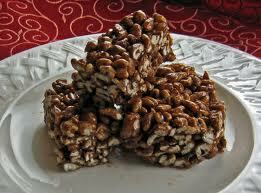 Pour over puffed wheat (in a large, separate bowl). Press evenly into a GREASED 9x13 (if you like them thinner) or 9x9 (if you like them thicker). I got this recipe from a cookbook I purchased in Whistler on our honeymoon. I make them every Christmas ... they're super yummy. makes a few dozen, depending on cookie size. - cream sugar and margarine; add egg and molasses and cream well. - sift dry ingredients together and add to the creamed mixture. This recipe is my own adaptation of one of Sophie Gray's - her cookbooks are amazing. Cook bacon & onions until browned. Add peppers, cook until soft. Set aside. In another bowl mix eggs and milk. Pour egg mixture into flour mixture. Add bacon saute to flour mixture. Add cheese to flour mixture. Pour into a WELL GREASED 9x9 glass baking dish. This is my mom's recipe, a favourite of mine growing up. It was a "for company" recipe but I use it all the time. SO good. Pour over chicken in 9x9 pan and bake COVERED for 1 hour.